UBC Vantage College offers specially-designed pathway programs for international students, which support the transition from high school to second-year university. The Vantage One programs are intended for academically strong international students whose English language proficiency does not yet meet the requirements for direct entry programs at UBC. These 11-month programs combines first year coursework with additional academic mentorship and English language resources, so each student is prepared to successfully progress into the second year of their chosen UBC degree. Vantage One offers four streams of study including Arts, Engineering, Management and Science, enhanced by Academic English classes, passionate professors and student service specialists to maximize the Vantage One experience. The next intake for Vantage One students will begin in late August 2019 and conclude in July 2020. * Average for Term 1/Term 2 (Sept–Apr), Term 3: to be determined. When you first arrive at UBC, your Vantage One program will begin with an orientation alongside other first year students. You will take care of essential needs like health insurance and setting up banking, learn what to expect and how to thrive in the classroom at UBC. Jump Start is a one week immersion program in August and continues to support students throughout their first year at UBC. 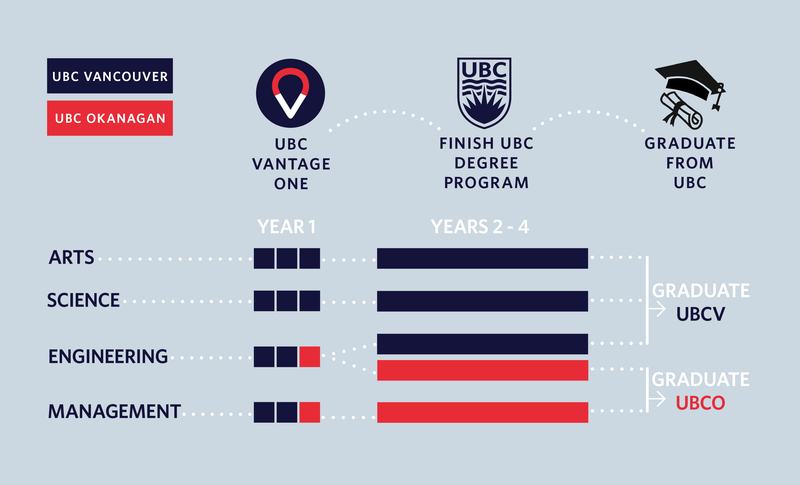 Through the 11-month program, all UBC Vantage College students will complete full first year university credits to gain entry to the second year of their degree program. While you will be completing the same courses as other UBC students, your classes will be tailored to you and allow for additional academic preparation through options such as smaller class sizes, alternative teaching methods, language instruction integrated with coursework, and increased faculty interaction. 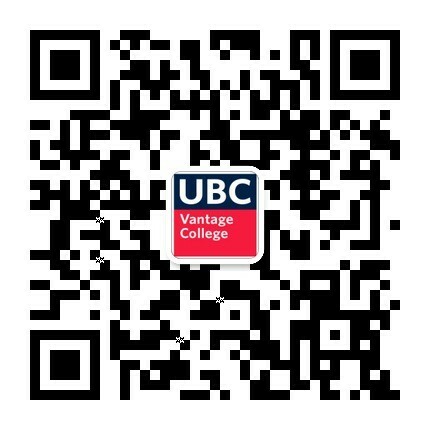 Your experience at UBC Vantage College is shaped by your needs and interests. In addition to regular scheduled classes, you will also have access to academic advising and academic English tutoring. These options are designed to give you every opportunity to succeed. Upon completion, you will be fully prepared and confident in your ability to enter the second year of your degree. All students complete Term 1 and Term 2 at UBC Vancouver. In Term 3 (May to July), the UBC campus you attend will be determined by your program of study (see below). Once you finish your Vantage One program and progress into second year, you may complete your degree studies at UBC Vancouver or UBC Okanagan, depending on your field of study and academic results.